Just about every parent of a Raza child (and every brown child) en el norte has had the painful experience of having to deal with racism at school. Here, in an angry response to Benjamín’s winning save in a game of handball, his friend calls him a hurtful word. 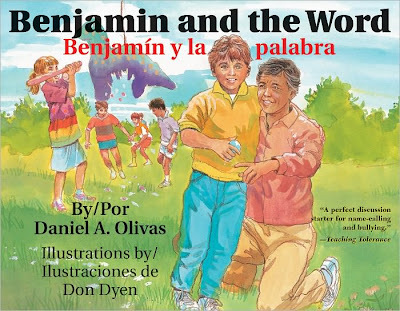 The story focuses on how Benjamín’s father helps his son sort out his feelings, and empowers him to confront his friend and secure an apology. As a discussion-starter for very young children, a story like this can be successful. But there are some issues that seem to have been avoided. For instance, where did Benjamín’s friend learn this word and why did he think it was OK to use it? Another troubling thing is that Benjamin’s father solves the problem in a simplistic way—he’s lecturing his son (and the reader) about people who “have made up all sorts of mean words to hurt those who are different from them…such as people from different cultures or different religions.” This kind of lecturing also fails to place the responsibility where it belongs. Not recommended.